Barnaby Joyce, the man who wants to be deputy PM again, has a volatile temper and deals with constituents by denigrating them if they disagree with him. Sydney bureau chief Ross Jones reports. On top of his all his other woes now he’s being stalked. Or so he says. 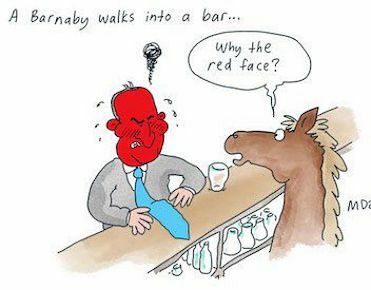 Former Senator Barnaby Joyce claims he is being stalked following a heated encounter at a New England pub. In fact, Barnaby's claim about being stalked is false. Monday afternoon, 3.05 pm, the sleepy town of Graman, about 40k northwest of Inverell. Two blokes walk into Graman’s only pub, called, unsurprisingly, the Graman Hotel. Inside the bar, big enough only to hold a dozen or so dedicated drinkers, Barnaby Joyce is having a beer with a few of them. His minder is with him. The two blokes get a beer each and take a seat. Unbeknownst to Barnaby, one of these blokes is a dedicated, professional environmentalist, the other an accomplished martial arts exponent. Because Barnaby’s staff will not reveal his itinerary, the two blokes had to put in a bit of sleuthing to discover BJ was going to be at the Graman that afternoon. As constituents, they felt they had a few valid questions to put to him. They were soon drawn into Barnaby’s group and, after the usual pleasantries of names and handshakes, the environmentalist asked Barnaby a few questions. Barnaby responded by deriding him as a "Green". "Well, you look like a fuckwit." The other bloke – the martial arts guy who also dabbles in thinking about politics, especially New England politics – then intervened, asking Barnaby about the salary he took while he was ineligible to sit. It seems that, apart from one small tense time when Barnaby’s drinking buddies threatened to throw the pair down the stairs – which would have been a bad move given the drinking buddies’ age and physical condition, coupled with their likely opponent – things remained calm. For Barnaby, though, his congenial drinks session had been disrupted and he was over it. He stood up and announced he was adjourning to the Tamworth Leagues Club. In the spirit of campaigning, Barnaby shook hands with everybody, including the two blokes. It wasn’t said loudly, but Barnaby, who is clearly not hard of hearing, spun on his heels as if stung and, fists clenched, stormed back into the bar. There was silence in the bar. Slack jaws all around, including Barnaby’s minder, who you would think would be equipped to handle these kinds of situations — it’s hard to think it was his first. Barnaby sort of did but, in a final act of petulant defiance, reached down and knocked the environmentalist’s hat from his head. When questioned by Fairfax Media on Tuesday morning, Mr Joyce didn’t deny he flicked the man’s hat off his head during the confrontation, but said his “private life is private”. Well, it was, until Barnaby paraded his family before the readers of the Weekend Australian in a move designed solely to advance his political career. Once you go there, you can’t go back. “We’ve had death threats and now we’ve got stalkers,” Mr Joyce said. By death threats, Barnaby was referring to a bullet he allegedly received in the post. Police have been called after a bullet accompanied by a threatening note from an Adani protester was sent to Barnaby Joyce’s former electorate office in Tamworth. The bullet arrived earlier this week with a note about the $1 billion loan the federal government wants to grant to Adani. It also mentioned other environmental issues, including mining on the Liverpool Plains. “People always think these wonderful green lobbyists, they’re all so peaceful,’’ Mr Joyce said yesterday. “Well, no. They’ve sent a bullet to my office, which apparently was supposed to go through my head and this is the sort of garbage we have to put up with. NSW Police Deputy Commissioner for regional field operations, Gary Worboys, was in Tamworth on Thursday and said he was made aware of the situation that morning. “I’m told that there is some forensic analysis going forward,” he said. By the sounds of it, police have so far failed to set up the dedicated task force necessary to ensure the rapid CSI-style result required before Barnaby is gunned down in Peel Street by an assassin dressed as a tree. “The campaign is becoming dirty and people are sending people around to stalk you. “I’ll be frank, they’re not coming from the Labor Party, they’re coming from other people. “We had a discussion but I mean, I’m not going to go into it because there’s a whole lot of issues behind that individual. Allegations of stalking are patent rubbish, of course. The environmentalist in the pub had spoken with Barnaby only once before — some weeks prior to the Graman contretemps. That is hardly stalking. The environmentalist is a constituent, the Graman Hotel is a public house and Barnaby is a public figure. No one followed Barnaby around, no one peered in his windows, no one chased him into the bathroom. In short, it is vastly different to the behaviour that could constitute the offence of stalking under section 13 of the Crimes (Domestic and Personal Violence) Act 2007. Flicking someone's hat off, however, could constitute assault in NSW if there was a legitimate fear of violence. And given Barnaby had, according to one witness, "gone through every shade from red to purple to beetroot" just prior to the incident, this is surely arguable. My take from this event is that Barnaby is a man with a violent temper and tissue skin who was very lucky the martial arts guy was around to diffuse the situation before Barnaby did something really stupid — like hit someone. This is not the first time Barnaby had gotten aggro with constituents who disagreed with him. Ambush? Of course, this was another Joyce-driven beat-up. This was just two female constituents in a pub asking Barnaby about mining. Joyce, ever the gentleman, told them to "piss off". Aggressively. This is a man who, believe it or not, was Australia’s deputy PM, albeit unconstitutionally. This is a man with delusions of being stalked. This is a man who alleges "greenies" are trying to kill him. This is a man to wants to become deputy PM again. Sydney bureau chief Ross Jones is a licensed private enquiry agent. You can follow Ross on Twitter @RPZJones. Get the facts. Subscribe to IA. 1 April 2019, 11:00am That James Ashby is still anywhere near Australian politics beggars belief.